Local musicians have joined hands with various arts associations, City of Harare, private companies and non-governmental organisations (NGOs) to mobilise resources for victims of cyclone Idai which ravaged parts of the country over the weekend. The musicians will hold a show dubbed "The Cyclone Relief Concert" on Friday afternoon at the Julius Nyerere Way Parkade. It is a joint effort by Zimbabwe Musicians Union (ZIMU), Air Freight Cargo Zim Ltd, United Women in Music (UWM), The Heart of the Mountain, Trans Smart Trust and Mbiravolution among other organisations. The concert will feature various musicians including BaShupi, Edith WeUtonga, Ammi Jamanda, Transit Crew, Sister Flame and Tatenda Pinjisi among others. Organisers have extended an open invitation to all musicians that want to be part of the event. UWM representative Edith WeUtonga said the concert is a launch of many events to be held across Harare. "At this event we are encouraging people to donate money via the Econet Fund as it is matching dollar for dollar on every donation thus the amount you donate will be doubled. "As a collective we are however encouraging people to donate things people need for their day to day survival including food, clothes, sanitary wear, buckets, and bottled water among other needs," she said. WeUtonga said to get admission to the concert, individuals should bring donations. "After the concert we will have a series of events in different wards in Harare where we will connect with the people encouraging them to assist those in need," she said. Meanwhile, comedians will also have a show to mobilise resources at the Harare International Conference Centre (HICC) on March 29. The event will feature over six comedians who are yet to be announced. 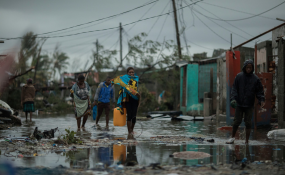 Cyclone Idai hit Zimbabwe from last Thursday, leaving a trail of destruction in Manicaland, Masvingo and Mashonaland East provinces.